Playing in the NBA from 1971-1982 with the Cavs, Bucks, Lakers, and Buffalo Braves (now the LA Clippers), Elmore Smith developed a passion for blocking shots - 17 blocks in one game alone! - an NBA record that stands to this very day. 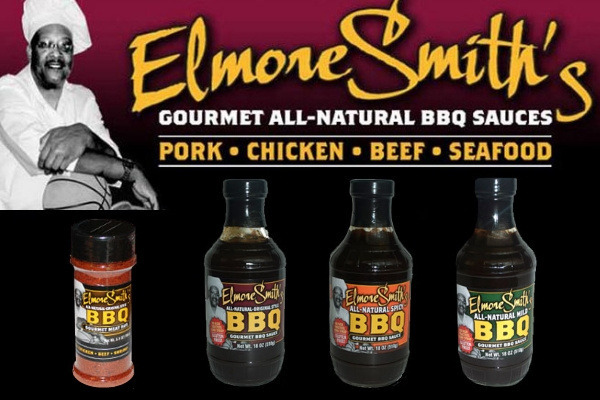 This passion for excellence lives on in Elmore Smith's all-natural gourmet BBQ Sauces. These sauces (Original Style, Ultra-Tangy Mild, Spicy Style and Gourmet Rub) are the result of extensive trial and error over many years of barbecuing, and feature a rich smoky flavor punctuated by subtle variations in texture and heat settings which provide an amazing taste experience. The company Elmore Smith started in 2006 was founded on principles, passion and a deep love of crafting great sauces. He's succeeded in developing a proven line of sauces and rubs, and now he needs help launching an organization that can respond to a growing demand for his products. That organization will ensure that the Elmore Smith line of BBQ sauces and rubs is fully funded to set the stage for a nationwide mass production and distribution effort, which will serve customers at an online (website) retail level and eventually will expand into grocery stores, supermarkets and institutions throughout the U.S. But first we must develop a winning team that can adequately address the current demand and put the business on track to provide the best sauces and rubs on the planet while ensuring record-setting product quality. As Elmore put it, "I am very thankful for the opportunities provided throughout my career, and truly grateful for an unbending faith that has enabled me to meet amazing people all over the country with whom I can share my sauces. Will you help me lay the foundation for an organization that is being built to get my proven products to the masses? Will you join with me on a quest to put Elmore Smith's BBQ Sauce LLC on the map?" THANK YOU for taking a look at Elmore's Go Fund Me page. You can check out his entire line of sauces and rubs at www.ElmoreSmithBBQsauce.com.